Has the push back begun? Quote: America’s ruling class has been experiencing more pushback than usual lately. It just might be a harbinger of things to come. middlefinger;135965 Wrote: Has the push back begun? 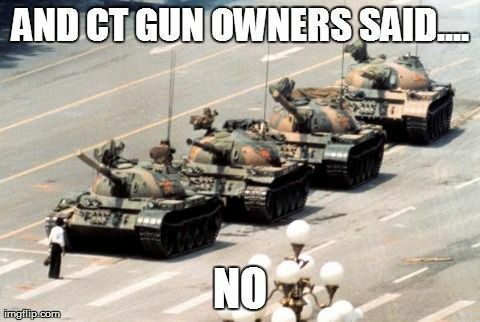 I am fascinated by the entire semi-auto registration in CT. I think it is very telling that so many (the vast majority of) gun owners opted to defy the law. What is even more telling is that it happened without a major coordinated effort. It virtually guarantees that nobody will ever enforce it. And, if they do, I suspect we will see the first shots fired in a war against our government. I would compare the men and women that are defying the law to the student in China that stood in front of the tanks in Tiananmen Square. I have to say I am surprised by what we are seeing up in CT. I thought for sure when such laws went into effect a majority of gun owners would be lining up. It is nice to be proven wrong. It is mildly humorous (for the time being) to see how the government up there is downplaying the entire situation in the media. Political upheaval has risen since the election of a far left ideologue as president. The mostly content right became very vocal with the rise of the Tea party and the emboldened left countered with the feigned outrage of the Occupy movement. The way the media handled both further enraged the right and further emboldened the left. The way this administration flaunts their disdain for the rule of law and the constitution is maddening enough but they proactively step on the rights of conservatives using the power of the government. This is truly tyranny in a very Orwellian sense. Expect three more years of unrest. Coops;135986 Wrote: Expect three more years of unrest. NO political party truly gives a damn about normal people. The Republicans won't fix this, as they've mostly played along aside from a few people considered to be "extremists" by most of America. The Libertarians will probably only serve to fracture the conservative vote, making a Hillary Clinton presidency more assured. Everytime I see this picture I want to ask the question. How do all those people just sit there and watch this guy get run over? Then duck tape my head so I don't have my brain explode from the comments.. The next thing I want to do is whenever people swear our military will open fire on us, is show them this picture and ask if the Chinese didn't really do it why would our soldiers do it? ExcelToExcel;135989 Wrote: Everytime I see this picture I want to ask the question. How do all those people just sit there and watch this guy get run over? Then duck tape my head so I don't have my brain explode from the comments.. The next thing I want to do is whenever people swear our military will open fire on us, is show them this picture and ask if the Chinese didn't really do it why would our soldiers do it? Counts range from 2 to 3 hundred up to 5000. Quote: At 4:45 p.m., commanded by Gen. Douglas MacArthur, the 12th Infantry Regiment, Fort Howard, Maryland, and the 3rd Cavalry Regiment, supported by six battle tanks commanded by Maj. George S. Patton, formed in Pennsylvania Avenue while thousands of civil service employees left work to line the street and watch. The Bonus Marchers, believing the troops were marching in their honor, cheered the troops until Patton ordered the cavalry to charge them—an action which prompted the spectators to yell, "Shame! Shame!" Quote: The Battle of Blair Mountain was one of the largest civil uprisings in United States history and the largest armed rebellion since the American Civil War. For five days in late August and early September 1921, in Logan County, West Virginia, some 10,000 armed coal miners confronted 3,000 lawmen and strikebreakers, called the Logan Defenders, who were backed by coal mine operators during an attempt by the miners to unionize the southwestern West Virginia coalfields. The battle ended after approximately one million rounds were fired, and the United States Army intervened by presidential order. By-the-by, there is a purge going on in the military of officers whose views dont coincide with the current admin. There are a few things to consider here. First, I think CT is a bit different, as it would be state authorities and local LEOs that would have to enforce this law. I think these gunowners are calling their bluff, and I think it'll work. I don't think the state will ever move to enforce. If they do move to enforce I imagine one of the gun owners will protect his rights with his firearm. Once that happens, everyone will start shooting. It becomes a response to the shooting for the LEOs. If this happens a few times, then I believe the LEOs will start to rebel against the enforcement of the law. If it gets to that point, then the Federal gov will get involved and it will become a real offensive against all gun owners in CT. Then we'll see if the army will fire on its citizens. I don't think it will get to enforcement at all though.